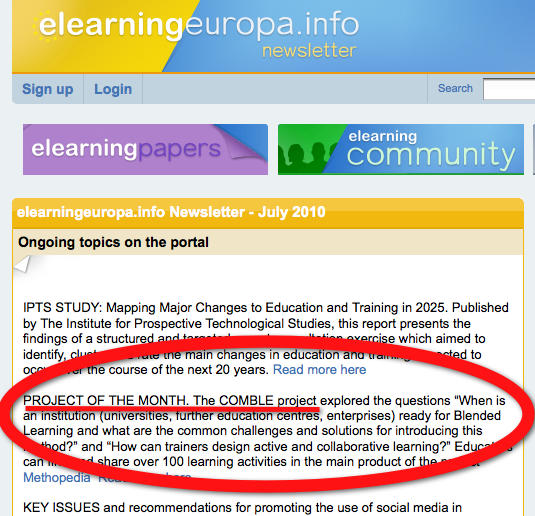 In this project several colleagues from e-Learning Lab (Aalborg University) and I worked together with partners from Germany, Poland and Estonia from January 2008 – December 2009. When is an institution (universities, further education, enterprises) ready for Blended Learning? How can trainers design for active and collaborative learning? 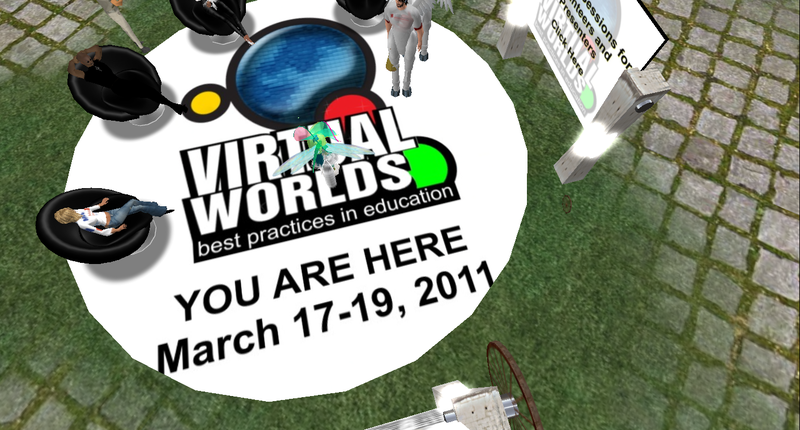 Together with my PhD-colleague, Heilyn Camacho, I designed and ran a highly successful 6 week course on Problem Based Blended Learning in Second Life and Moodle on which I’ve written several posts (i.e. this one explaining the course concept). A scene from one of the SLectures in the course. A wiki-based community called Methopedia for Blended Learning experts to share relevant knowledge and experience. Methopedia is available in four languages and contains about 100 different learning activities and an interactive seminar planer. A Blended Learning Readiness Wiki to support strategic planning, change management and the evaluation of blended learning scenarios at the institutional level. The Methopedia Learning Designer: an online flash tool to design seminars. So we’re approaching the final week of the PBBL course and it is time to reflect a bit. My colleague Heilyn and I have managed to reflect on the course activities for every week and we have posted these reflections in Moodle, so that the participants could get an idea of why we have designed course elements in certain ways and what we have thought of the outcome. These meta-reflections (on which the participants have commented) have proved to be very valuable in both our and the participants’ learning experience and it is definitely a course component I want to further develop in my next course. In this post I’ll highlight some of our reflections. In the first SLecture the text and voice check took almost 45 min. and Heilyn and I agreed that this was unacceptable, so in the second SLecture we reduced the scheduled time to 15 min. and we put out further information on voice settings etc. It worked for the majority of the participants, but there still seems to be 1-2 participants in every session struggling with technical problems. We actually asked everybody to check out if they could access especially SL before enrolling in this course, but in future courses this should be stressed, since we cannot help/ do anything about local problems e.g. firewall problems, inadequate graphics cards, poor internet connections and lack of headset etc. 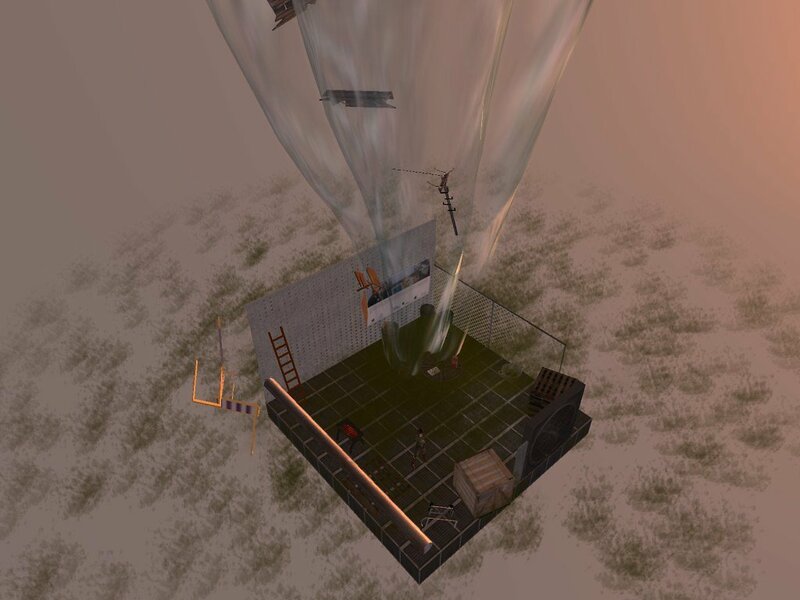 In designing this course we had planned a preparation week where participants were expected to solve a newbie assignment aimed at learning the basic skills in SL. These activities were optional and unfortunately very few participants decided to make use of this offer. For future courses we would recommend making newbie assignments/activities mandatory. 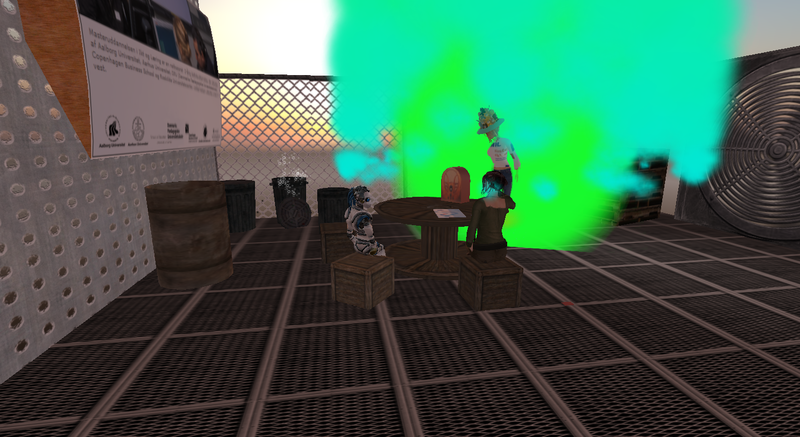 The third SLecture was Heilyn’s first real teaching experience in SL, and I think she did a great job. Her presentation was about Action Learning and by the end of the SLecture the Learning Teams were asked to go shopping for Team mascots. I asked Heilyn about her experience and she pointed out two things. First of all she did not consider doing a presentation a creative way of teaching. I agree, but I do believe presentations are necessary when the participants have little or no prior experience with the subject matter, come from very different pedagogical cultures, speak different languages and in general have very different prerequisites. Lecturing then serves the purpose of trying to establish common ground, common language, common terminology and as a means to clarify questions. I also believe that the participants’ general SL skills should be taken into consideration before planning more difficult activities. 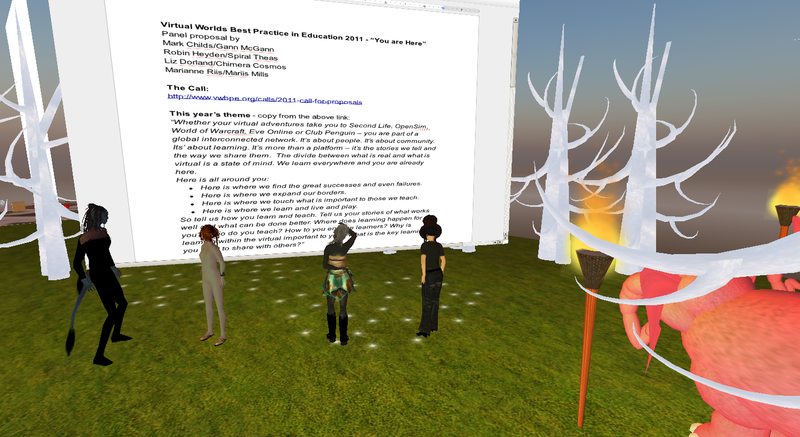 Besides this, I do believe that lectures in SL are quite different from conventional f2f lectures due to the possibility of using simultaneous voice and text. Recognizing that participation in lectures is not the most interesting way to get to know SL, we have also included Optional visits, and in the first visit I showed the participants Zotarah Shepherd’s MI design and Thursday Xu’s designs of Bloom’s taxonomy and Wenger’s CoP. Touring, exploring and trying out things together in an informal way combined with discussion on topics that are somewhat peripheral to the subject matter is in my opinion a very nice activity, and judging from the feedback the participants also appreciate this kind of activity. The fifth SLecture was on PBL, networked learning and web 2.0 technologies conducted by my other colleague, Thomas. I was not able to attend, but judging by the comments in Moodle the participants enjoyed the lecture. At this point in the course Heilyn and I decided to make part of the lectures more interactive, since the participants now seemed more at ease in SL. For the 6th SLecture we prepared 5 statements on PBL/AL and used them together with the Opinionater tool. This turned out to be a very interesting exercise. We had not anticipated that the participants would disagree to the extent that they actually did. The Opinionater is a quite simple tool, but highly effective. We managed to have some interesting discussions on different aspects of PBL/AL and in that sense the tool also served as a formative evaluation tool giving us educators some hints on the participants’ perceptions. After this exercise I took some of the participants to U21 Global Island where we tried out the Metaphor Tour. 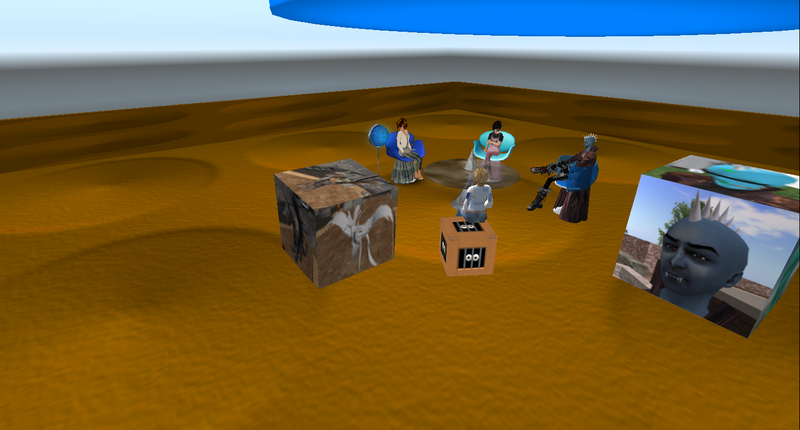 In the second optional visit we met my friend, Inge Qunhua who is a Danish educator and SL designer. Inge has a lot of creative ideas and has made several small displays of her designs on her island. In the seventh SLecture this week we experimented with video display, but it did not turn out quite as we had hoped it would. However, we have not yet reflected on this experience, so I’ll return to that in a future post. This week the participants were expected to hand in their Mini-projects on Friday. Only 3 out of 6 teams did so, and this in my opinion is not satisfactory. For the last 10 years I’ve been using project work in my teaching and I’ve never before had the experience of only half of the students/participants handing in projects. One team has asked for an extension of the deadline, whereas the two other teams haven’t given us any indication of what’s going on. This course has been designed as a test course with the aim of finding out whether this certain design is sustainable and even though we all have learned a lot, I’m not convinced that this particular design is suitable for the general learning objectives. Learning about PBL – especially the way we see this at Aalborg University, where we combine PBL with project organization – is a process that needs a lot of time. I’ve been skeptical of the very short course period (6 weeks, incl. preparation) from the beginning. We actually wanted to design a 10 week course, but preliminary investigations among our project partners indicated that a 10 week period would be too long. I can think of several reasons as to why only half of the teams managed to hand in their projects on time, but I’ll wait with further conclusions till we have done both project and course evaluation next week….